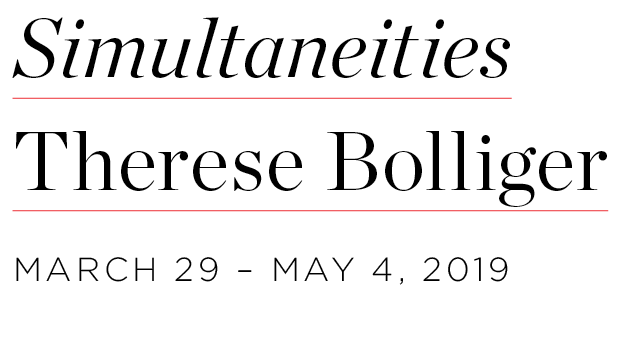 Christie Contemporary is pleased to present Simultaneitites, a solo exhibition of work by Therese Bolliger, opening Friday, March 29 and continuing until May 4. This exhibition juxtaposes two bodies of work, Untitled Series and almost/not quite/perhaps. The construct of simultaneity informs both bodies of work, emphasizing a reading of time moving away from a linear model toward one in which distinct histories collapse and cultural boundaries are crossed. Almost/not quite/perhaps consists of one hundred propositions, configurations of three nouns each, invoking associations around notions of philosophy, science, literature, semiotics. This loose field of word constructs prompts viewers to consider possible interpretations as a process which does not offer a final reading, but remains speculative.